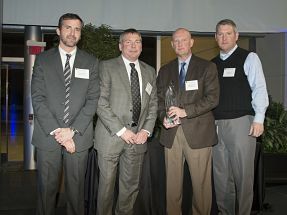 SOUTH BEND, IN – Elkhart Plastics, Inc. (Elkhart Plastics) was honored to accept a 2014 Diamond Supplier Award from Navistar International Corporation. 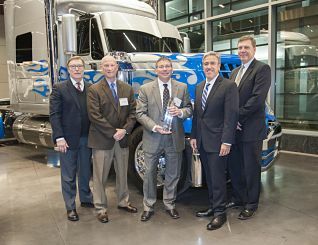 Elkhart was one of 26 Navistar suppliers to be recognized for outstanding performance in quality, delivery, technology, and cost by the Lisle, Ill.-based company. Elkhart Plastics is one of more than 1,200 Navistar suppliers globally. “Our products are only as good as the parts we use to build them. We expect every one of our products to have exceptional quality and uptime, and the 26 suppliers receiving this award have set the bar for that level of performance,” said Phil Christman, Navistar’s Senior Vice President and Chief Procurement Officer. Elkhart CEO Jack Welter and Vice President of Sales and Marketing Todd Outman attended a ceremony in late January to accept the award. “We are proud to be included in Navistar’s elite group of Diamond Suppliers,” Welter said. “Designing and producing high-quality, durable, affordable, and precision-made products is an everyday commitment for the entire Elkhart Plastics team and we certainly appreciate being recognized for these efforts by a company as respected as Navistar. From left, Troy Clarke of Navistar, Jack Welter and Todd Outman of Elkhart Plastics, and Tom Smith of Navistar are pictured. “We look forward to continued success at all of our six plants as well as maintaining a great working relationship with Navistar in the years to come,” Welter said.